Oregon, that is. If you've never been to this resort town at the edge of the Pacific, you should make plans to visit sometime soon. Seaside sits at the end of the Lewis and Clark Trail and is a national landmark. The Corps of Discovery made camp here in 1806 in order to make much needed salt to cure meat for the long journey back East. In the 1870s, Ben "the Stagecoach King" Holladay built a summer cottage here, which he dubbed "Seaside House," and from where the city gets its preset name. The cottage, now the site of the Seaside Golf Course, was reported to accommodate up to 125 guests at a time. Fortunes came and went, but Seaside has remained a summer getaway for Portlanders and world travelers alike. Its 250 foot wide beach is the most heavily used of any beach on the Oregon Coast. And the 1.8 mile promenade or "Prom", as it is known, provides an excellent opportunity to stroll and take in the natural beauty of this place. Hey, did you know the tallest douglas fir tree in the world was discovered in Seaside? Yep, in 1962 the clatsop fir was declared the king of coastal firs, measuring 200 feet 6 inches tall, and 15 feet in diameter. Unfortunately, a Pacific storm blew through just a few months later and knocked the giant down. The tree was estimated to be 702 years old, which would have made it a sapling during the time that Kublai Khan took the reigns of the Mongol Empire. Are you kidding me?! While in Seaside, I am staying at The Resort at Seaside by WorldMark. This is a beautiful resort, located right on the Prom (see what I did there? ), with shops and a restaurant on the first floor, heated outdoor pool, whirlpool, and a "reactive" fountain for the kids to play with. I'm in a 1 bedroom oceanfront unit that sleeps four. Looks like you can get a similar unit for as little as $114/night. There's also a 2 bedroom/2 bathroom unit for sale at an asking price of $6,500. RedWeek members give this place 5 stars, and I can see why. Sign up for a posting alert and be notified as units become available for rent or sale. 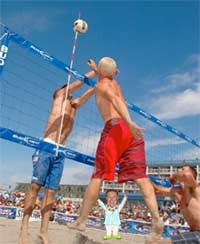 Well I am going to go get in a little beach volleyball practice. That's right, I am a beach volleyball enthusiast and Seaside happens to be home to the largest amateur tournament in the country. Over 700 teams compete each August to see who will be crowned champion. The tourney is in its 29th year and I am hoping to catch on with a team that needs the services of a slow-footed, but crafty, veteran of the "old school" variety. A Cinderella story in the making. Or, I might end up back in the hospital like after my bull encounter. Hmmm, I'd better check my out-of-pocket on my health insurance first.